London’s Notting Hill Carnival originated in 1959 as a way for the UK’s Afro-Caribbean communities to celebrate their culture and settle at the time simmering race relations with fellow Londoners. Held over every August Bank Holiday long-weekend, culminating in Monday’s Notting Hill Grand Finale Parade, it has evolved into the largest street festival in Europe. The two-day carnival hosts some 50,000 street performers, around 40 sound systems and is enjoyed by an estimated 2.5 million people. Festivities kick-off this year on Saturday night with a steel band competition at Emslie Horniman’s Pleasance Park from 6pm. The first full day of the festival, Sunday, is children’s day with a shorter parade route and costume prizes. The main parade is held on Bank Holiday Monday between 9am and 7pm and festivities continue at the many after-parties once the float procession has finished. The parade snakes through 2.2 miles (or 3.5km) of Notting Hill streets, starting at Great Western Road travelling south along Chepstow Road, west along Westbourne Grove and north along Ladbroke Grove. The many streets and laneways in between are full of incredible smelling Caribbean and Jamaican food stalls, pumping sound systems, overflowing party pubs and crowded street bars. Most of the shop fronts and many homes have been boarded up for the weekend and all of the streets are restricted to foot traffic or parade traffic only. The carnival is surrounded by several London Tube stations including Notting Hill Gate, Bayswater, Royal Oak, Westbourne Park, Holland Park and Queensway. Notting Hill Gate station on the jam-packed Central Line is particularly busy and should be avoided if possible. Check tfl.gov.uk for changes to bus routes and Tube travel during this time. The wonderful aromas of traditional Caribbean food provoke a healthy appetite for all carnival goers. As someone who had not experienced these exotic cuisines, the Notting Hill Carnival provided me with the perfect introduction to tasty jerk chicken with rice and peas, potent rum punch and char-grilled corn on the cob. Shop around for the best deals and expect to queue for the food stalls with the best smells and best meal deals. While the traditional steel bands, Soca & Calypso music are still there, huge sound systems have taken over the streets and play anything from Reggae to R&B, Funk, House, Dub and much more. Live stages feature many local bands, but top international artists have been known to make appearances. Steel Pan, or Steelbands, fill the streets with melodic sounds and strings of followers and dancers. 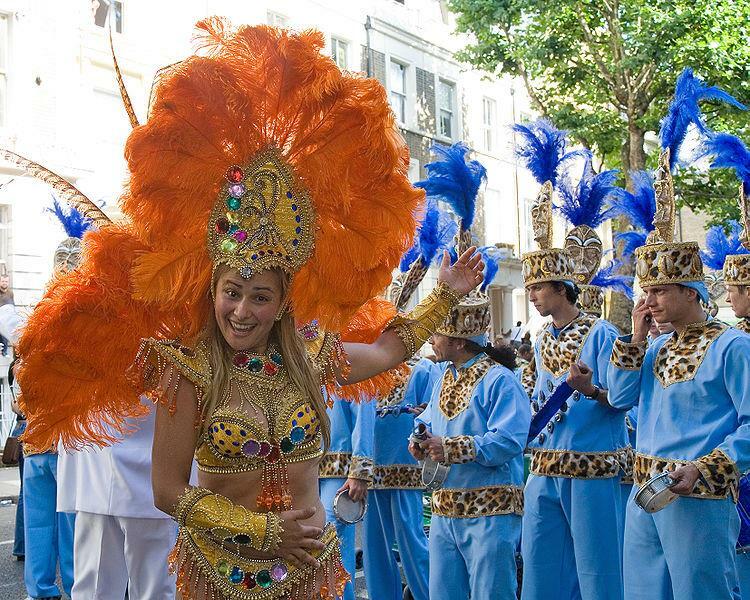 Samba music and dance, Latin Jazz, Reggae and Drum ‘n’ Bass provide a loud but fun atmosphere in almost every street. 1. Loo paper: whether you are having a drink or not, you will need to use the toilet at some point during the day. Within a couple of hours the toilets are filthy, the lines are ridiculously long and the toilet paper is non-existent. If you want to be able to use the facilities comfortably, take your own stash of loo paper so that you are not caught out. Alternatively, there are many home owners and pubs along the route that will open up their toilet to you for a small fee. 2. Cash: ATMs are limited and lines are long, also many of the food and drinks stalls are cash only. It’s a good idea to take some cash to cover your food, drinks and possible toilet stops! 3. Your typical British weather kit: Summer in London is usually warm, with an average August temperature of about 20°C (68°F) and lows of 13°C (55°F). With cool nights, 16 hours of sunlight and a chance of showers approximately 12 days in the month, I would take your usual “British Weather Kit” — an umbrella, a light jumper/jacket and sunglasses and possibly a hat. 4. 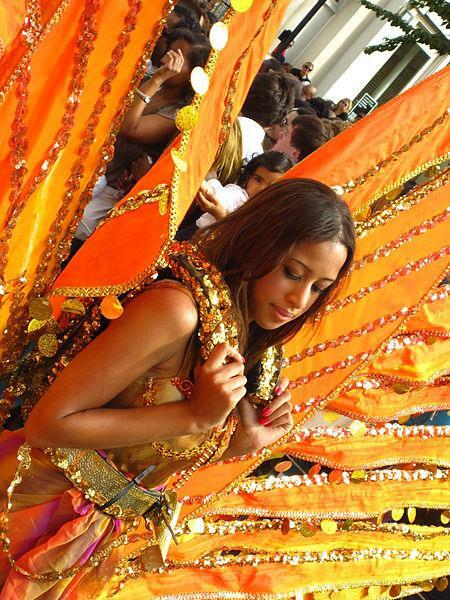 A mobile phone alternative: With so many people in a relatively small area, there is a chance that you will not have enough mobile phone reception to use the Notting Hill Carnival app, check in on Facebook or make a phone call. Use the maps to make a time and place to meet with your friends before you get there. Have a plan for what to do if someone from your group goes walkabout. 5. Your best dance moves: With such an array of bands, DJs and stereo systems you will find yourself wanting to put on your dancing shoes and sway your hips to the addictive and melodic Caribbean sounds that fill the streets. Let your hair down and enjoy a dance!